The Ohio State University's graduate programs offer numerous opportunities to study East Asia. Since the founding of the Department of East Asian Languages and Literatures in 1969, OSU has instituted a PhD program in Chinese (1969) and Japanese (1989), and more recently, added a unique target-language-only MA in Advanced Chinese Language and Culture. 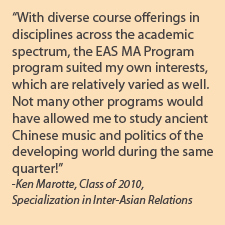 In 2005, the Interdisciplinary East Asian Studies MA Program was inaugurated and began admitting students into a program designed to prepare students for professional careers requiring knowledge of East Asia and for disciplinary and interdisciplinary academic study. Since 2006, 20 OSU departments in disciplinary and professional fields, including some of the top-ranked graduate programs in the country (linguistics, psychology, political science, social studies and global education, art education), have trained dozens of East Asia-related PhDs. Professional schools have also been continuously expanding the range of opportunities for students with interests in East Asia. Under the aegis of the Center for International Business Education and Research, the Fisher College of Business has created new specialized courses on East Asia, staged an emerging market course with study-abroad components in East Asian countries (China, Vietnam), broadened the palette of student exchanges with top business schools in East Asia, and developed joint certificates with universities in East Asia. The Moritz College of Law offers a specialization in International and Comparative Law with an attending certificate of Legal Issues in International Trade and Development with relevant courses taught by East Asian faculty. The College of Education and Human Ecology offers an MEd in Foreign Language Education with increasingly popular sub-specializations in teaching K-12 Chinese and Japanese. The East Asian faculty in the College of Agriculture, Food, and Environmental Sciences not only offer courses on issues related to East Asia, but also regularly host a summer study abroad program at the Chinese Academy of Agricultural Sciences (Beijing). Under the auspices of the Center for Global Health, the Health Sciences at OSU have joined to create a Graduate Interdisciplinary Specialization in Global Health with new courses and the option for a fourth-year medical rotation abroad. The medical residency program encompasses four university hospitals in China, including one that specializes in traditional Chinese medicine. The General Education Curriculum has been redesigned to seamlessly accomodate international experiences, and other major programs are also systematically internationalizing. As a result, all OSU undergraduates will receive an international curriculum. Those wishing to seek deeper understanding of East Asia can do so through a variety of programs. Undergraduates pursue East Asian studies through a variety of fields in the humanities (East Asian languages and literatures, history, history of art, comparative studies, linguistics), the social sciences (economics, geography, international studies, political science, sociology), and business. East Asian Languages and Literatures offers majors and minors in Chinese, Japanese, and Korean. In addition, History and History of Art offer concentrations in East Asia, and the Undergraduate International Studies Program (UISP) offers a major, minor, and a certificate in East Asian studies. The East Asian studies programs can also be combined for a double major with one of UISP's four thematic tracks (security and intelligence, international relations, world economics and business, development studies) or the BA in Globalization. Meanwhile, OSU's Center for International Business Education and Research has been at the forefront of expanding training opportunities for business majors via new courses, international student exchange programs, in-country internships, and certificate programs.